Internal combustion engine vehicles are the most produced and sold vehicles on the market. In recent years, interest in electric vehicles has begun to increase, especially due to the environmental problems. In the near future, it is estimated that gasoline and diesel vehicles will be completely electric vehicles. For this reason, many studies have been conducted on electric vehicles. Particularly the change of the engine parts, the turning of the internal combustion part to the electric motor, and the design of these motors has become an important parameter. In order to improve the performances of electric vehicles, the batteries of electric motors have been improved. In this study, a simulation was carried out to conversion 1.3 JTD and 1.3 Multijet motors to electric vehicles and the performances of these forms are evaluated by comparing the motor power, torque, and speed of the two vehicles. It was tried to predict what kind of changes will be achieved by conversion these two cars into electrical forms. PID controllers were used for inspecting components. In the study including detailed calculations, the program named AVL Cruise was used. The findings have shown that the quality of the new electric vehicle equipment used instead of the internal combustion engine can also affect results. The graphs from electric vehicles were explained and compared in detail. It was observed that there may be significant differences in the efficiency of the vehicles as a result of the conversion of the internal combustion engine to the electric motor. This made the biggest difference between the two vehicles. Since there is no data related to the sale prices of vehicles in the case of the conversion internal combustion vehicles to electric vehicles, comparisons were performed only on equipment. The latest price information of the vehicles has not been discussed. Nor, J.K., Art of charging electric vehicle batteries. WESCON/93. Conf. Rec., San Francisco, CA, 1993. Dhameja, S., Electric vehicle battery systems; Press: Newnes Press Boston, 2002. Leitman, S. and Brant, B., Build your own electric vehicle, Press: McGraw-Hill Companies, USA, 2008. Çınar, M.A; Gündoğan, Ç; Kuyumcu, F.E., Elektrik tahrikli taşıtlar için çekiş kontrol sistemi simülasyonu. ELECO'2004 Elektrik Elektronik Bilgisayar Mühendisliği Sempozyumu, Bursa, Türkiye, 8-12 Aralık 2004. Jin, L.Q; Cai, W.B., Study on fuzzy control for starting torque of vehicle with motorized wheels, IEEE 7th International Power Electronics and Motion Control Conference – ECCE, Harbin, China, 2-5 Haziran 2012. Meilan, Z; Liping, Z; Yu, Z; Zhaoming, G; Rongjie, P., Pure electric vehicle power-train parameters matching based on vehicle performance, International Journal of Control and Automation. 2015; 8(9), pp 53-62. Bambang, W; Widodo, B.S; Arifin, N.A., Analysis of range extender electric vehicle performance using vehicle simulator, Energy Procedia, 2015; 68, pp 409 – 418. Yajuan, Y.; Han, Z.; Hao, J., Drive train design and modeling of a parallel diesel hybrid electric bus based on avl/cruise, World Electric Vehicle Journal, 2010, 4, pp 75-81. AVL list GmbH. AVL Cruise theory manual; Document no. 04.0108.2009, Austria, 2009. Kuo, B., Otomatik kontrol sistemleri; Press: Literatür Yayıncılık, Türkiye, 1999. Dorf, R., Modern control systems; Press: Pearson, USA, 2014. Palm, W., System dynamics; Press: McGraw Hill International, USA, 2014. ISNAD Mengi, Onur Özdal . "Conversion of Diesel Vehicles to Electric Vehicles and Controlled by PID Controller". 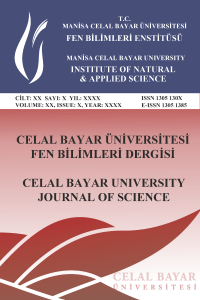 Celal Bayar University Journal of Science 13 / 4 (December 2017): 901-906.